In the photo on the right you can see the finished date paste being added to a cooked down mixture of sugar and maltose. Maltose 麥芽糖 (photo on the left) is a natural Chinese sugar made from rice and malt that is used for a lot of traditional Chinese sweet treats. Maltose has a distinct taste and is what makes this candy so deliciously chewy. Tip: Maltose sugar is really stiff at room temperature! Water the hands generously and you can peel the syrup out without it sticking to you. Or you can heat it up and it will soften enough to get it out. Once the date paste and the sugars are cooked down and thickened it's time to add your walnuts. For extra yumminess, lightly toast the walnuts first. For the final cooking down of the candy have a bowl of cold water at hand. Once you think the mixture is thickened enough, test by spooning a bit of the paste into the cold water. The chilled water will cool down the paste and show the final consistency. The perfect consistency is the paste hardening enough to form a solid mass that is still soft and flexible when you press on it. If the paste doesn't come together you need to keep cooking and testing until ready. Once your candy passes the water drop test, immediately pour out onto a silicone mat or parchment paper covered surface. If you want to really control the shape you can pour into a baking tray. Use an oiled rolling pin to press down and smooth the candy out. Or, as I did, just use another silicone mat (they're so useful!) to press down with your hands. But...be careful, the candy is super duper hot at this stage! When your candy is completely cooled it's time to cut. The trick to cutting this sticky candy is to keep your sharp knife oiled as you cut. Cut into equal sized rectangles, keeping the candies separate as you cut or they will stick to each other. Wrap candies with twists of parchment paper, clear candy wrappers or with edible glutinous rice paper as per the traditional style. The surprising thing, as I've mentioned earlier, was how good these candies tasted! The rich soft sweetness of the date paste the prefect counterpoint to the nutty, slightly bitter harder bite of the walnuts sprinkled throughout. It must be the freshness of the ingredients or something but I swear that Chinese Date Walnut Candy has never tasted as good as when homemade! Happy Chinese New Year Gong Hei Fat Choy 恭喜發財!!! 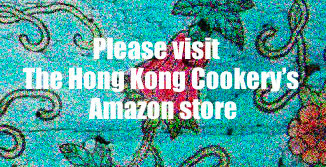 - from all of us at The Hong Kong Cookery. Prepare a small bowl of water and set in fridge to chill. Lightly toss walnuts in a hot wok for a few minutes or until aromatic and just lightly browned. Let cool. In a thick bottomed nonstick pan, add in maltose, sugar, salt and 1/3 cup water. Cook over low heat until sugar dissolved and maltose softened. Add in date paste and continue stirring until the mixture thickens. Mix corn starch and water together, then add in, stirring to mix. Add in the oil and stir to mix in. Continue stirring until oil in completely incorporated and the mixture starts to separate from sides and bottom of the pan. Add in the walnuts, stirring gently to mix in. Keep gently stirring the candy paste over low heat until quite thick or for approx. another 15-20 mins. Test candy's readiness by dropping a small spoonful of mixture into the bowl of chilled water. If the mixture holds its shape easily but is still flexible when pressed then it is ready. If the mixture does not hold shape then keep cooking and retest until ready. Pour onto silicon mat or parchment paper covered surface. Use a oiled rolling pin to smooth and press to 3/4" thickness. Let cool completely. Using an oiled knife, slice into 3/4" slices, setting aside each slice without touching each other (or they will stick to each other). Cut slices into 2" lengths, again setting out without touching. Use edible rice paper wrappers* to wrap candies. Store in an airtight container and eat up within a month. *Tip: If you can't get the rice paper wrappers cut parchment paper into 3 1/2" by 4" rectangles and use to wrap around the candies with a twist on each end. Thank you for this recipe! This is one of my FAVORITE candies, and our stash from Taiwan is dwindling, so I am excited to try this out sometime ! !